A new adaptive optics approach sharpens microscope images for biologists studying the zebrafish. The technique rapidly corrects for distortions in transparent, nonscattering tissues at the millimeter scale without exposing them to damaging levels of light, making it well-suited to imaging the transparent bodies of zebrafish, an important model organism for biology. A membrane-labeled subset of neurons in the brain of a living zebrafish embryo is seen in a frame grab from an adaptive optics microscope operating in two-photon excitation mode. Courtesy of HHMI Janelia Farm Research Campus. 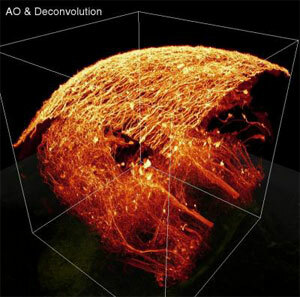 Dr. Eric Betzig, a team leader at the Howard Hughes Medical Institute's Janelia Farm Research Campus, postdoctoral fellow Dr. Kai Wang and colleagues used the technique to bring into focus the fine, branching structures and subcellular organelles of nerve cells deep in the living brain of a zebrafish. These structures remain blurry and indistinct under the same microscope without adaptive optics. The technique involves two-photon excitation, and takes its cues from laser-induced guide stars used to correct for atmospheric turbulence in astronomy and descanning methods used to average out motion-induced errors in retinal imaging. The researchers shined their own type of guide star across area of tissue, and the returning light was analyzed by a wavefront sensor to determine what optical corrections were necessary. The adaptive optics compensated for spatial variation in aberrations and recovered diffraction-limited imaging over large volumes (>240 mm per side) with a 14 ms update rate. 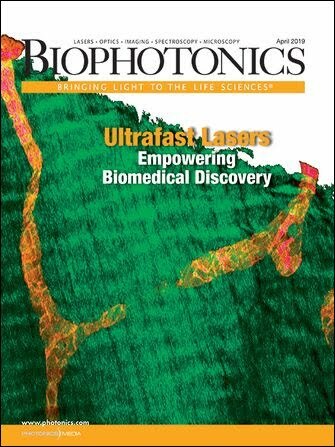 "We combined the descan concept from the ophthalmologists with the laser guide stars of the astronomers, and came up with what amounts to a really good solution for aberrating but nonscattering transparent samples, like the zebrafish," Betzig said.